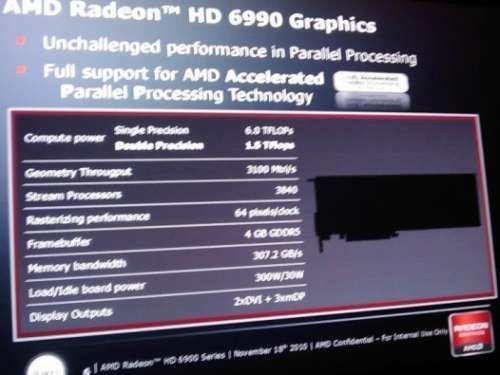 This nice slide shows some important features of AMD’s next dual-GPU card the Radeon HD 6990. The HD 6990 (based on the Antilles GPU — two Cayman GPUs –) will have 3840 shader processors (SP) or 1920SP per GPU. The card will embark 4GB of GDDR5 memory and the TDP will not exceed 300W thanks to the new power containment feature. 300W will certainly involve two 8-pin power connectors (see here: Maximum Power Consumption of Graphics Card Connectors). Since I am not interested in dual chip cards, the interesting bit of info here is the specs of the cayman chip. 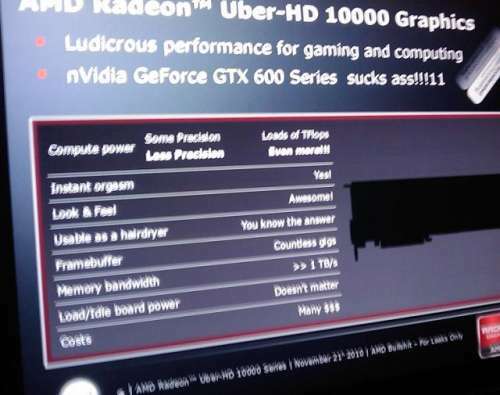 2x 480shaders = 1920×2 stream processors.